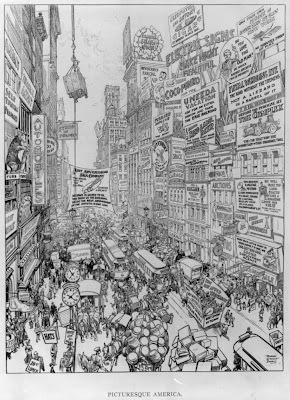 After recently reading about how devoid the paleo-future is of advertising I thought it'd be a good time to pull out a cartoon Harry Grant Dart drew for a 1909 issue of Life magazine. This image can be found in the Library of Congress Prints and Photographs Collection. Ooh, the Complex won the Schenectady to Troy endurance trial! Too bad the trial is simply suriviving boredom due to being in Schenectady and Troy. Still, this is basically an accurate picture of many major cities.